A very wet July and August has seen the return of the dreaded tomato blight. With a warm and dry start to the summer, the tomatoes were looking healthy and strong, then along came July and overnight the temperatures plummeted and the rain started. The rainy, damp days continued throughout non stop throughout August and the unmistakable dark patches on the stems and yellowing of the leaves, associated with blight, began to appear. Two weeks later and the leaves are brown and dead, with undeveloped fruits dropping from the plant…green tomato chutney, here we come. There is no denying the fact that this is Britain and global warming appears to be something we only hear about on the news. However, the simple truth is that tomatoes just cannot be grown outdoors in the Northern hemisphere and it would appear that our Welsh gardening friends have suffered the same fate, as have many growers in the US and Canada. Those who have been growing under glass, do seem to have had quite a bit of success this year…these plum tomatoes in Lancashire look as if they are just bursting with flavour. 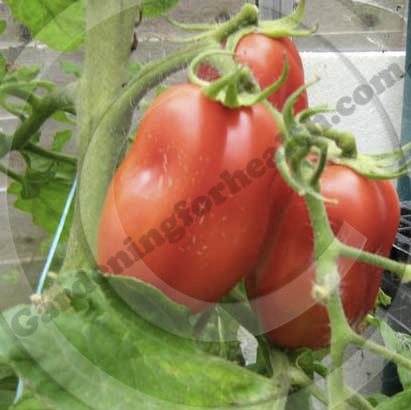 Growing tomatoes in a greenhouse or polytunnel helps to protect them from the blight spores and the extra heat and concentrated sunlight allow the fruit to ripen faster. The plant and it’s soil must be destroyed, preferably by burning. The infected material should never enter compost heaps, as the blight spores can overwinter. Any undamaged fruits can be harvested and eaten or used in cooking. If plants were grown in containers, the tubs or baskets will have to be thoroughly cleaned and disinfected. Plants grown in the garden soil will render that soil unsuitable for growing anything related to the tomato family for at least two or three years. Greenhouse crops can also become infected but less likely. If this does happen, then a complete scrub down of the greenhouse or polytunnel will be required, once the infected plants are removed. 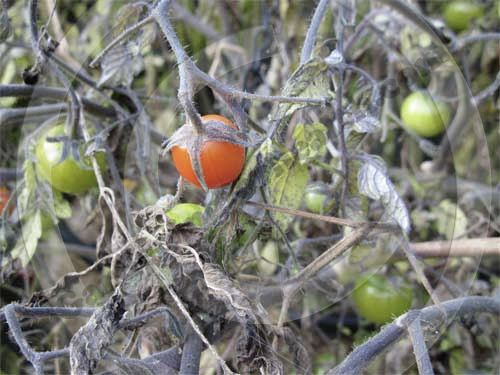 Tomato blight also affects plants of the same family such as potatoes. All of our popular tomato varieties succumb to blight very easily but hope may be on the horizon. A couple of cherry varieties Koralik and Matt’s Wild Cherry are showing signs of blight resistance. Koralik is a sprawling, bush variety and trials at the Garden Organic centre in Ryton over the last three years have been promising, so this will be a great tomato for growing in baskets. Global Edmonton (Canada) – Potato and tomato plants no longer accepted at city’s compost depots.